Our recent Kenya adventures led us to the villages of Linjoka, Tiira, and Gekka to hear first hand the stories of success with the family strengthening programs that have begun in these rural villages. The value of the family strengthening program is that it is a prevention method to help keep boys from going to the streets. We learned about the value of table lending, otherwise known as an internal savings and lending program. One of the earliest communities to embark on table lending was the village of Linjoka. Linjoka is the home of Elijah, one of the boys in the first group to be rescued from the streets. After seeing the success that Watoto wa Ahadi was having with turning his life around, with Sodzo's help, Elijah's mom helped gather a group of 30 ladies to form a savings and lending group. 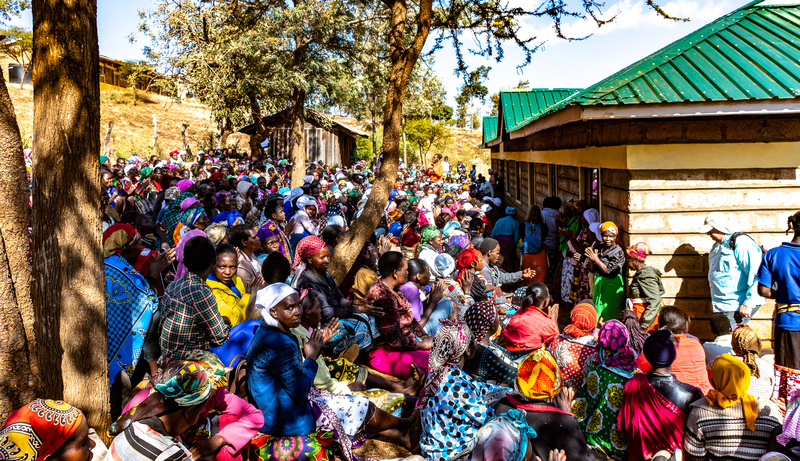 Each week the ladies gather and contribute 50 shillings (50 cents) to a savings plan, and then the ladies are able to borrow money from the pot, to be repaid the following week, along with a little bit of interest. The group has been able to grow the account to over 200,000 shillings, or the equivalent of over $2000. Considering that the average daily wage is about $1.50, that is a remarkable amount of savings for the group. The group has begun to prosper and has become a tight-knit family. Because they were able to borrow money for necessities, the ladies have begun to see a marked improvement in their home life. Other ladies saw the success of these groups and have decided they, too, wanted to improve their lives. Currently there are 31 groups of ladies in Linjoka, 23 groups in Tiira, and 16 groups in Gekka, who are meeting weekly to implement the savings and lending program. Each group consists of 30 ladies. We visited all three villages and were greeted by over 2000 people who came to hear a discussion on business planning and financial planning, and to share their stories of success. In Linjoka, water is one of the main concerns for the ladies. They are trying to save enough to purchase a 1000 liter tank for water that will allow them to store water and not have to travel with a jug on their backs 2-3 hours per day to retrieve water from the watering station. The tank costs 17,000 shillings and saving for the purchase of the tank for each member, was a long term goal for one of the groups. Another group had a member pass away, so the group used the money to purchase a house for the 5 children who were left behind. Houses cost about $500 and come with a dirt floor. They also worked with the local nun to help get the children into school to begin their education. In Tiira, one of the ladies was able to use the money to help pay school fees for her daughter. This has allowed her daughter to graduate and go on to the university. The family's life will be forever changed because of education. Many of the groups in Tiira and Gekka spoke about the desire to purchase livestock for each member of the group. This would allow the family to sell excess goat or cow's milk to the market, providing an income for the group. There was a strong sense of hope in each of these groups, as they have benefited from the savings and lending program. We take for granted clean water, sending our children to school for an education, or having a roof over our heads. The strong faith that these groups demonstrated was an inspiration to me. "Now faith is confidence in what we hope for and assurance about what we do not see." (Hebrews 11:1) The family strengthening program is growing and has proven to be very successful. As they say in Kenya, "God is Good - God is Good All the Time."